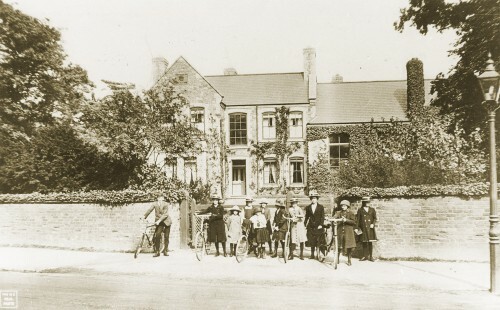 The Rawlins school was founded in Woodhouse in 1691 by Thomas Rawlins to accommodate twenty two or more boys from Woodhouse or Woodhouse Eaves. Should insufficient numbers be forthcoming, boys from Quorn were to be admitted. The school, like many others, declined during the early nineteenth century, so that in 1864 there was only the headmaster and one pupil, his son! The school was revived in 1890 when W E B Farnham, a Rawlins trustee, submitted a scheme to the Charity Commission which agreed to the school starting in Quorn, in the anterooms of the village hall on 15th September 1892. Mr Edward William Hensman was appointed the first headmaster. The school crest was originally a tortoise, this being the seal of Thomas Rawlins. However the crest was later changed to the two crescents of the Farnham family, after a generous bequest from George Francis Farnham in the 1930s.